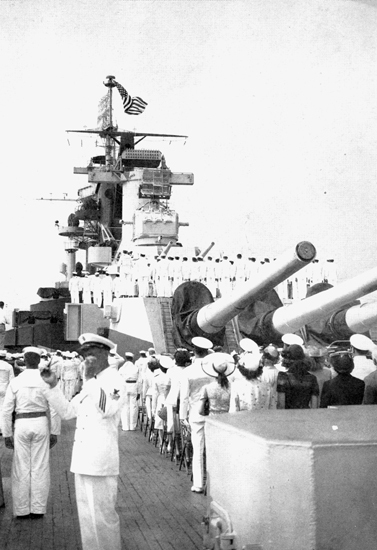 The keel of the USS Alaska was laid ten days after Pearl Harbor. Her crew had been assembling for more than six months, when on 17 June 1944, the Alaska was placed in commission by Rear Admiral Milo Draemel at the Philadelphia Navy Yard. The ship that was added to the United States Fleet that day in June was the first of a new class of "large cruisers." A sister ship, USS Guam, followed a few months later and another sister, USS Hawaii, is nearing completion. The ships of this class are the longest (808 feet) cruisers yet built. Only the Iowa class battleships and the Essex class carriers are larger. However, since these 30,000 ton Alaska class cruisers have the classic lines of smaller cruisers and a slight advantage in speed over the battleships and carriers, they are considered to be cruisers, in the fleet organization. Armed with nine 12-inc 50 caliber guns in their main batteries, they have seconcary and machine gun batteries common to all modern battleships, carriers and cruisers.